HeartsHanging hearts for the rearview, window, light and fan pulls! Sports DecorationsFootball and Baseball Suncatchers! Crystal Ball Display StandsDisplay stands for crystal balls, decorative eggs or large marbles. Gift CertificatesLooking for the perfect gift but cannot decide what to choose? Gift certificates are a great way to show that special someone that you care and gives them the flexibility to find something they love! Sale ItemsSave on selected items and closeouts! EarringsOffering a unique selection of handcrafted earrings! 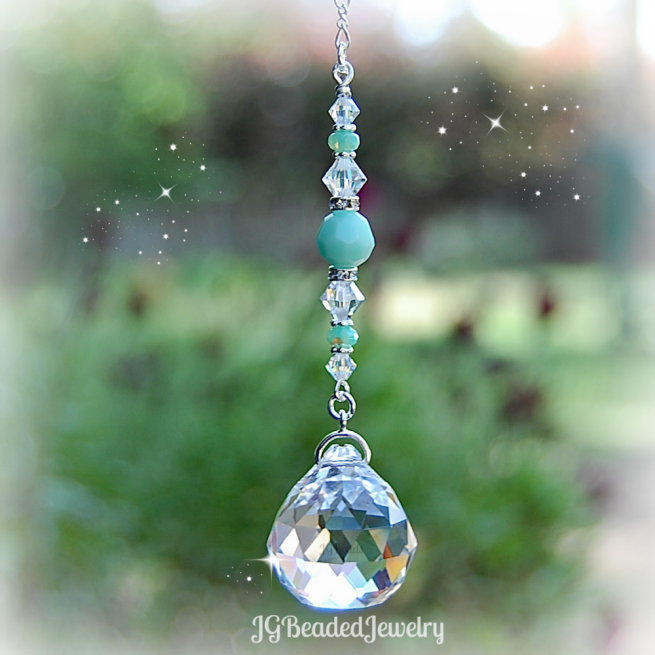 Designed with quality beads and gemstones! NecklacesOffering a selection of unique necklaces and pendants. Belly RingsBelly rings in an assortment of colors, charms and Swarovski crystals. Ankle BraceletsUnique beaded ankle bracelets. BraceletsUnique beaded bracelets designed with quality beads, pearls and gemstones. Matching JewelryA collection of matching necklaces and earrings! 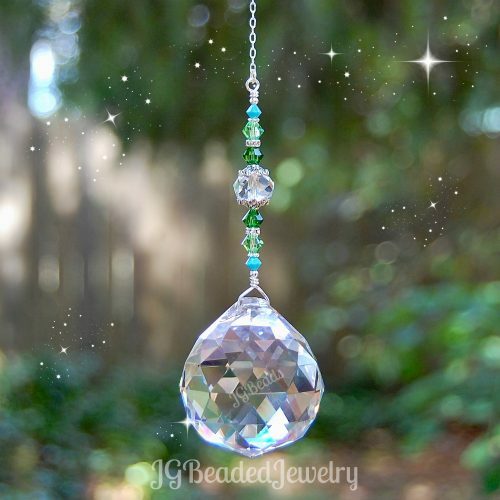 This mint green prism crystal ball suncatcher is uniquely designed with iridescent and mint green Swarovski crystals, fancy silver metal beads and a beautifully faceted clear 20mm prism crystal ball. Hang it from the rearview mirror, in a window at home, the office, nursery, sunroom or anywhere you choose! When the sun hits it just right, rainbows will be splashed about! The prism is available in Crystal Clear (shown in photo) or AB Clear (has a partial Aurora Borealis finish which increases the rainbow effect) from the drop down menu. Swarovski is known world wide for precision cut and brilliantly colored crystals – they are the best of the best! ♥ Special requests are welcomed, I am always happy to customize colors or work on unique designs to fit your wishes – just send a message with your request. 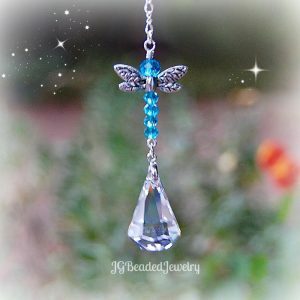 Offering unique and individually handcrafted Rearview Mirror Decorations, Crystal Suncatchers and Light/Fan Pulls! 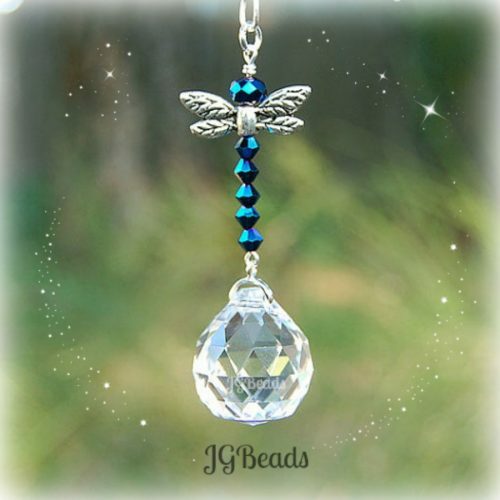 Check out JG Beaded Jewelry on Facebook for new items, special offers and giveaways! Sign up with us and we'll enter you into our monthly giveaway, you'll also receive an occasional newsletter to tell you about sales, exclusive specials and other cool things! Learn more about the Giveaway. To enter our monthly giveaway ~ signup for our occasional newsletter.